Halloween is one of the best holidays, period. Unlike Christmas or Thanksgiving, which force many of us to be on our best behavior and in our most starched collar, Halloween is an opportunity to dress up in a way that expresses something about ourselves—about who we are and what we like—with far fewer social consequences than we might face on any other day of the year. Of course this doesn’t apply at all to game characters. One of the reasons that studying fashion choices and character designs in videogames can be so interesting is that their outfits typically act as an extension of the character themselves, much like a carefully chosen Halloween costume can. From the template everyman to the summoner coming of age, a character’s costume can tell us a lot about them and even play into the game’s mechanics. Then again, sometimes it’s just about what looks cool, and there’s no shame in that. Yuna may not wear the most reasonable costumes in gaming history (as Gita Jackson recently outlined for Paste) but back when she debuted her ensembles were a hit among con-goers and cosplayers. It might be silly, but I still have a soft-spot for that weird wave-inspired thing I can only describe as a hip-cape. 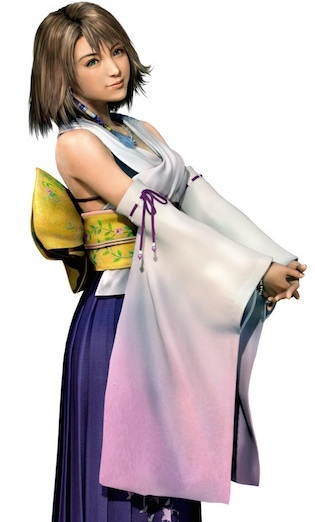 Credit where credit’s due, because Yuna’s taste in clothing (or rather, her character designers’) tapped into the ombre look a decade before mainstream fashion began incorporating it into everything from hairstyles to handbags. Cate’s wardrobe stands out as much because of what she is wearing as what she could have been wearing. Spy fiction is already not traditionally friendly to or respectful of women, and when you combine that with gaming—especially gaming as it was at the time—No One Lives Forever could have easily fallen prey to a lot of tacky and over-the-top styling choices. Instead, Cate’s closet is a retro treasure trove that evokes a feeling somewhere in between watching a pulp classic and going through old (embarrassing) photos of your mother and her friends. 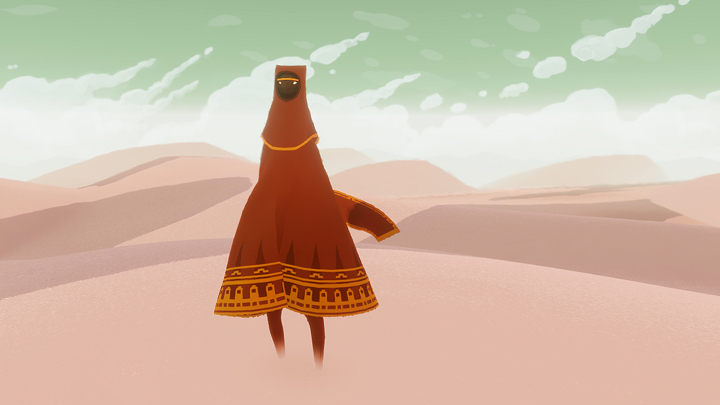 Fashion and function go hand in hand in Journey, but the way that material feels as it simply exists in that world is just as important as how it effects the nomad’s abilities. It just wouldn’t have been the same without the scarves swaying and pulling in the breeze, the skirt fluttering and flouncing as they drifted across the game’s vast spaces. The costume almost was the character, as much a traveler as a scrap of cloth tumbling in the wind. 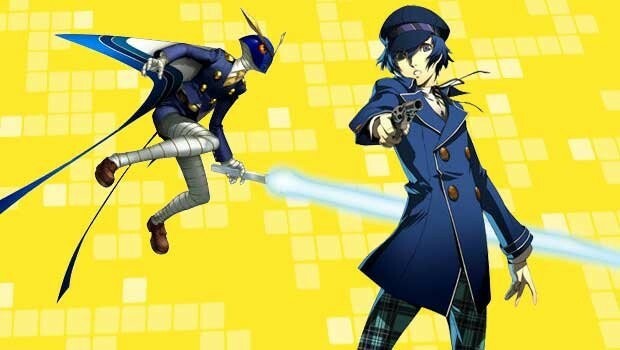 I dare you to name anyone that could pull off a navy blue peacoat with white piping, teal plaid pants, and a puffy little pageboy cap better than Naoto Shirogane. Anyone other than Cate Archer, I mean. Flemeth is a fascinating character in her own right, but when she appears at the beginning of Dragon Age 2 she’s on a whole other plane. Flemeth is quite unlike most older women in games: She’s not fragile or terribly kind, nor is she evil and merciless. She’s generally ambivalent about anything that doesn’t directly concern her, but she’s an unfathomably powerful ally nevertheless. Her costume in Dragon Age 2 is simultaneously plain and imposing, modest and yet sexually-charged. It’s a visual manifestation of so many of Flemeth’s own characteristics—characteristics that older female characters rarely get to have in popular media. Much that can be said of Flemeth can also be said of Madame, although she’s far from ambivalent about the player character. From a distance she could be mistaken for a tightly-suited bourgeois gentleman or even the ringmaster of a particularly depressing cyberpunk circus. 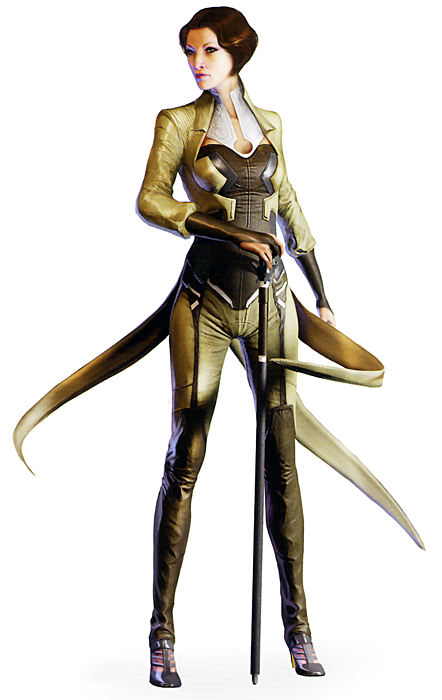 Her futuristic ensemble is almost certainly meant to evoke at least one (if not both) of these ideas thanks to her tails cane, and the conspicuously cravat-shaped cutout on her collar. Madame’s fight is one of the most frustrating in the entire game but Madame herself still makes a tremendous impression. 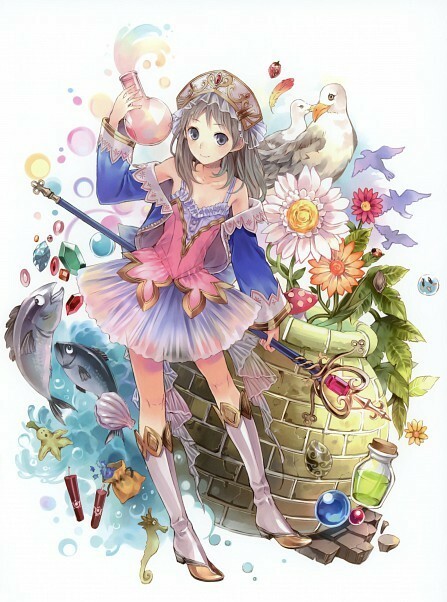 It’s not easy to pick a single character from the Atelier series to include on this list, because so many of them have been costumed so well. 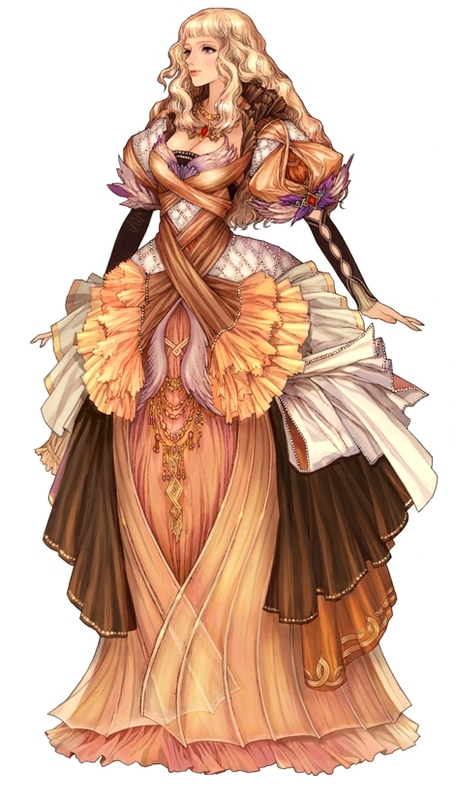 JRPGs typically approach character design with a degree of unbridled fanciness that you don’t see as often elsewhere, and costumes like Totori’s are flawless examples. You may notice that there aren’t all that many men on this list, and to be frank that’s because most men’s fashion in gaming is beyond boring. Really, how many battered leather jackets do we need to look at in a single lifetime? Look, there are a lot of preconceptions about women being interested in fashion and men being interested in everything but fashion, and that’s probably why so many female characters are designed with style and flourish that their male counterparts lack. It also may have something to do with the fact that we’re more accustomed to seeing female bodies as vehicles for beauty and artistic expression than we are male ones, but that’s a topic for a different critic in a different piece than this. 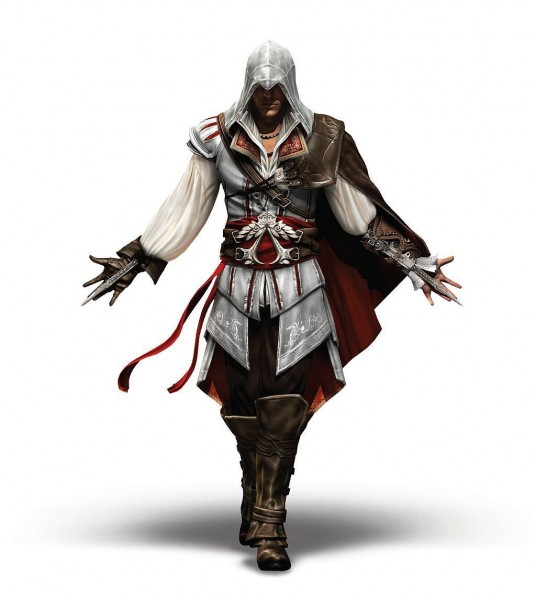 The point is that Ezio Auditore’s costumes, while still inspired by his much plainer predecessor Altair, were given many of the flourishes typically reserved for female costumes. The splashes of color, the touches of embroidery, the gilded accents—these are what make Ezio stand out. Granado Espada doesn’t have the same reach as the most popular free-to-play MMOs, but it does have some of the most unique costume designs in all of gaming. Just about everything players are given is dripping with intricate, baroque details, and even though its graphics are starting to show their age, this game still absolutely oozes style. It’s unfortunate that the Boyle sisters are essentially set dressing, a means towards an expository end, because they are among the most striking characters in that entire game. The player encounters Esma, Lydia and Waverly Boyle at a masked ball where the three are dressed in outfits that vary only in color. They each wear an impassive mask fitted with a towering hat and a chic, short-sleeved suit with pants and a gold brooch. 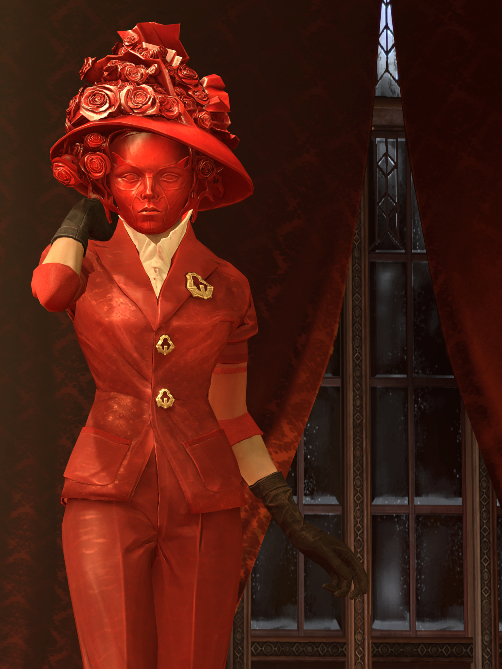 Although all of the women in Dishonored wear pants in spite of its pseudo-Victorian setting, it stands out the most at the party, which in any other game might be full to bursting with highly-structured gowns. In that sense, it’s hard not to notice the Boyles. When it comes to spacesuit and sci-fi armor designs it’s painfully rare to see any of the wearer’s personality shining through, which is precisely why Tali’s design is so outstanding. For Mass Effect’s Quarian race, environmental suits are worn all the time in place of standard clothing, since their weakened immune systems require extra protection. Even normal clothing functions as a kind of physical protection, but beyond that it’s also an incredibly important means of personal expression. 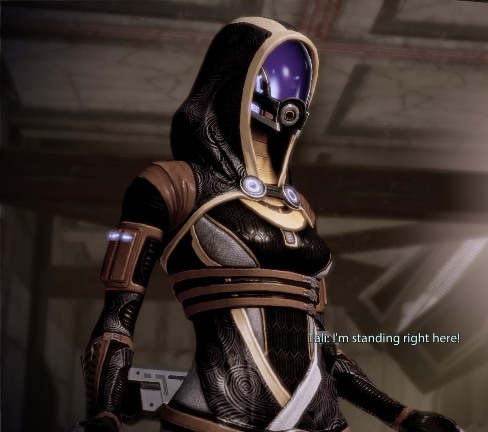 The way that Tali and the Quarians incorporate printed fabrics and accents into their attire is therefore not only visually interesting, but a very natural step for a group of people still seeking to express themselves (and their distinct culture) from within their full-body suits. Some characters could wear a paper bag and make it work. 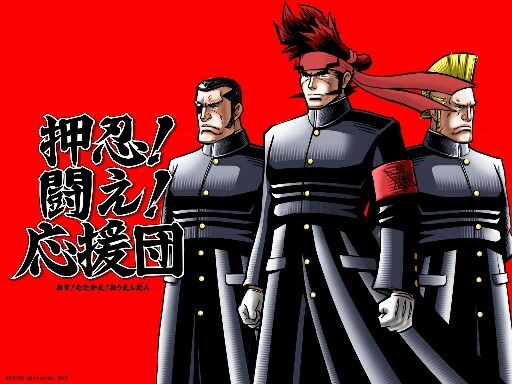 Obviously there’s a lot more to the uniforms worn by the Ouendan cheer squad than there is to a paper bag, but even so the simplicity of these outfits (based on standard Japanese school uniforms worn with Yankii flair) would otherwise seem out of place on this list if it wasn’t for who was wearing them, and how. The first time I saw Bayonetta, I loved almost everything about her look. 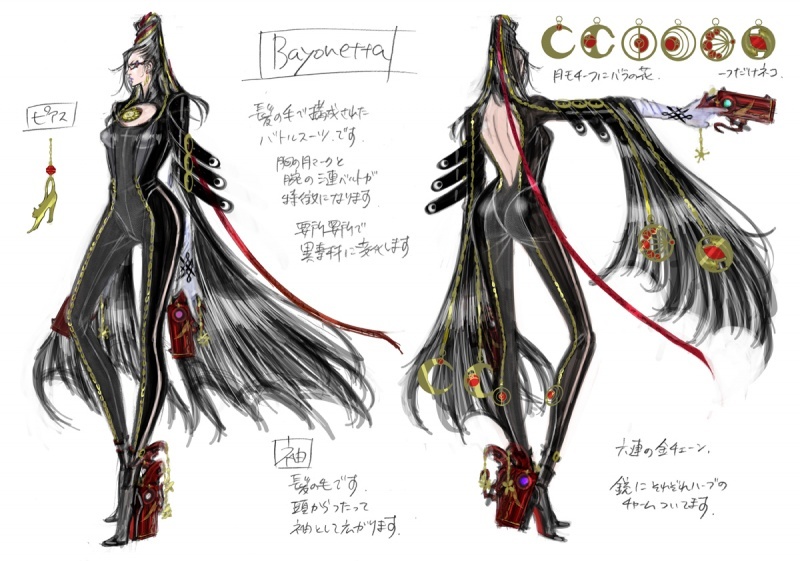 Her stained-glass specs, her fashionable neutral lipstick, her classic beauty mark, her accented bodysuit, her killer high heels (killer in the sense that they are very chic and also happen to be guns)—all of these thing make Bayonetta unforgettable. While many have mixed feelings about how her character is handled in the products bearing her name, it’s hard to deny that she’s one of the most fabulously costumed characters in the history of gaming. Janine Hawkins is a games writer based in sunny Canada. You can find her written and video work on HealerArcherMage.com or follow her on Twitter @bleatingheart.